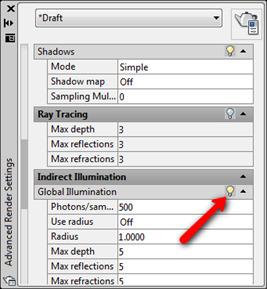 Setting Up AutoCAD Sun Light is Easy! Do you think setting up lights for AutoCAD rendering is difficult? Or do you think trial and error for setting up AutoCAD lights take too much time? Not really. In this rendering tutorial, you will learn to setup the sun light easily and a little trick to speed up the rendering test. This is the second part of our rendering tutorial. We have defined our camera view in previous tutorial. Next, we are going to define the AutoCAD lighting. We will discuss sun light (or natural lighting) and artificial lighting separately. Sun light comes first. Lighting is one of the most important thing in rendering. If you already downloaded the DWG file from the previous tutorial, I apologize. I forgot to add floor to the model, you can download this one to continue with this tutorial. And of course, you can use your own model. Why not we define the objects’ material first? Setting up rendering light can take a lot of time. You need to do several rendering tests until you get what you want. Having your materials defined already, will make the rendering slower. Especially when you have many reflective and transparent materials. With no materials defined, the rendering will be faster to get the proper lighting. After we satisfied with the lighting, then we define the materials. First, we need to turn the material off. Go to render tab, materials panel. Check if the materials/textures off. Turn it off if it’s still on. This is a pretty simple model. 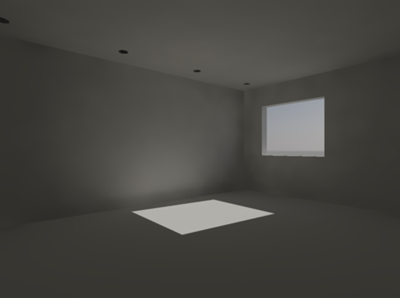 If your model have several windows or opening, you can try to set the light to come through from your preferred opening/window. Our objective is to get the solar light come through from the window, and in this model we only have one. So let’s turn off the window’s glass layer. In this file, the layer would be 3D-GLAZ-GLAS. The next layers you are going to turn off is totally up to you. In very complex model, it would be wise if we turn off objects that is not too important in setting up lights. If you have powerful machine and working on a relatively small model, you may not feel the difference. But when you have a bit old machine and the model has many geometries, then this can help. 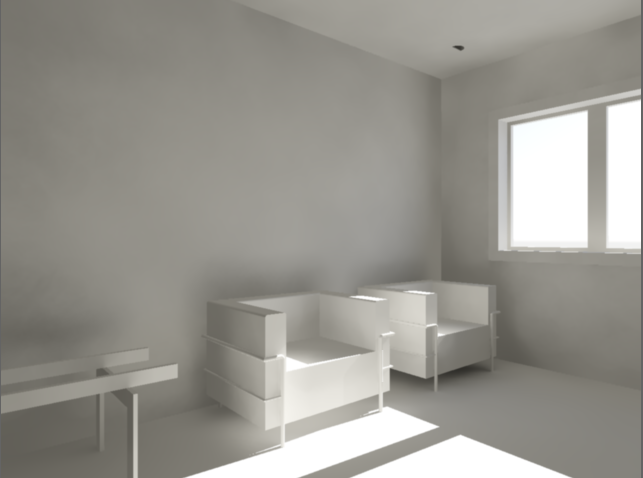 This model is quite simple, but let us hide the furniture to set up our lighting fixtures. Leave the wall, ceiling, and floor layers on. To define the solar light properly, we need to set the geographic location. Click set location in Sun & Location tab. AutoCAD will give you options how you want to define the location. For this tutorial, choose enter location values. We will have another dialog box opened. 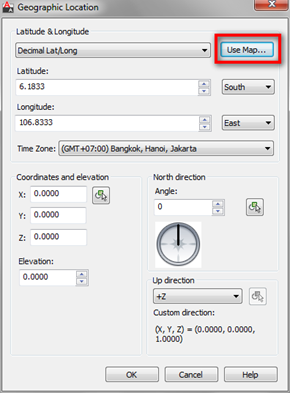 You can define the location by typing the latitude and longitude. Or simpler way to do it is by using use map. Pick your location and click OK until all dialog are closed. I use Jakarta as my location. Your result will look different if you choose other location. But it doesn’t matter. Now let us turn on the sky. If we don’t turn it on, the sky will be black. Not so nice for daylight rendering, right? Next, let us set the sun. click the sun status icon. When you do it for the first time, AutoCAD will give you some options. Choose to turn off default lighting. Default lighting is ugly. We are going to use natural light from the sun. After you turn off the default lighting, you could see the date and time slider active. Turn on shadows. Change the setting from no shadows to full shadows. Now try to change the date and time until you can see the sun light come through the window. Do it until you feel the light angle is good. In photography, morning and afternoon sun light is considered as the perfect time. It gives a great lighting depth and covers wider area than when the sun right above your head. We are going to test our light settings, but this is not a final render yet. So you can use lower quality to render it. I suggest you to try on medium quality. Draft and low quality give very rough lighting effect. Medium quality is more relevant. 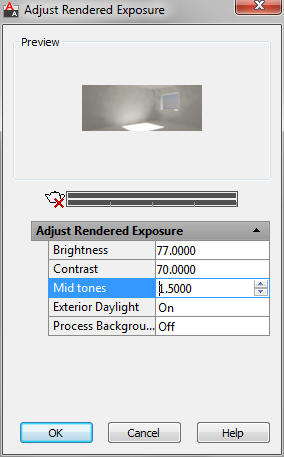 Click the small arrow on the lower right of render panel to open advanced render settings. 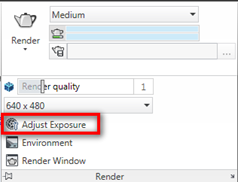 In the advanced render settings, change the render quality to medium. 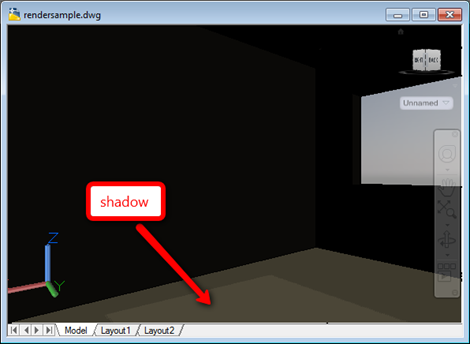 And find indirect illumination category in that palette. Click the light bulb next to global illumination to turn it on. Without indirect light, we will not see the effect of the bouncing lights. Turning it on will make the rendering longer. If you are experienced, you may be able to predict the final result without turning it on. But let us try with the indirect light on. Click render and wait a few minutes to see the result. I think this is nice. Now let us adjust the exposure. This is totally up to you. I feel the render result is not bright enough, and not enough contrast. So I will adjust them. Click adjust exposure to open the dialog. AutoCAD will open a dialog. There are several settings that you can change to make the rendering result nicer. You can click the up and down arrow or simply type new value. The preview window will update as soon as you change the values. Do it until you feel it’s good enough. Now let us test the rendering again. This is what I get. Better, right? Remember, in the real rendering setup, you may need to do several trial before you get satisfied result. And finally, after we feel it’s nice enough, test it with your objects on. If you are using your model, and have different result with mine, I would like to see how it looks. And I believe the others would like to compare with theirs. So put in on you blog, Flickr, Photobucket, CAD Notes facebook page, or anywhere people can see it. Share the link to your rendering result using the comment form below. Aren’t you feel excited how the result would looks like? Keep following this tutorial! We will do it together! I work as an Application Engineer in Jakarta, Indonesia. I've been using AutoCAD since R14 and Revit since Revit Building 9. I occasionally write for AUGIWorld magazine and also active in Autodesk discussion forum. I'm an Autodesk Certified Professional (ACP) for Revit Architecture and AutoCAD. I'm also a member of Autodesk Expert Elite, appreciation for individuals who give contribution to Autodesk community. Un trabajo magnifico, para quienes profundizamos en esta actividad tan amplia felicitaciones Edwin. don't mind. i found it. sun and sky settings are on the properties inspector. and what about the mac version? how the sun light works??? I'm glad that you can solve it. Sometimes you need to recheck your settings, like sky background and light. See if they're on. AutoCAD sometimes turn them off after you make some changes. 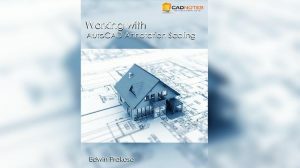 I'm going to keep an eye on this site (I like the short but EFFECTIVE tutorials), but I've seen there's been a while between your last Autocad 3D post (faking the door) and now. Are you planning to post more stuff in the future or..? And just out of curiosity, do you work with Blender as wel? Sure I will write more AutoCAD 3d posts. Oops, pressed button too fastt..
Now, I'm trying to put a picture outside the window, so that if I render looking outside I get a more scenery look? Any tips? Is this actually done by placing pictures in the direction of rendering? Or is this a little bit noobish.. There are many tricks you can use. Modeling everything is not a good decision. It will consume many resources, take a long time to render. Hé, this was a very good short tutorial! Finaly i can make some decent renderings now! I've read the newer ones too. Very interesting. To celebrate CADnotes 8th anniversary, we provide this e-book for all readers. It is free. It covers how Annotation Scaling works and how to use it. We hope you will like it!